1. A political unit, such as a city, town, or village, incorporated for local self-government. 2. A body of officials appointed to manage the affairs of a local political unit. A judge told me that he could not take judicial notice of a legislative bill because he needed proof it was passed, is not repealed, and is now standing law. He said I need to get a certified copy from the keeper of legislative bills. I ordered 4 certified copies of the attached 1905 Nebraska Bill which states that there must be a ‘for hire’ activity before the Motor Vehicle written laws can be applied. Now it is the obligation for the Prosecutor to produce evidence that it is not standing law. I personally find no changes. The no surprise fact is that the codified statutes, which is not law but only evidence of law until rebutted, has removed the ‘for hire’ requirement. this is nothing short of evil. Below is how the bill is originally passed. The next paragraph below is how the code revisionist have taken out the ‘for hire’ element, this done in violation for the bill has not been evidenced as being changed. 5388o Sec. 150 [Municipal ordinances.] Cities and towns shall have no power to pass, in force or maintain any ordinance, rule or regulation requiring of any owner or operator of a motor vehicle any license or permit to use the public highways or exclude or prohibit any motor vehicle whose owner has complied with section two (2) or section four (4) of this act from the free use of such highways, and all such ordinances, rules or regulations now in force, are hereby declared to be of no validity or effect: provided that nothing in this act shall be construed as limiting the power of local authorities to make and force and maintain an ordinance, rule or regulations, in addition to the provisions of this act, affecting motor vehicles which are offered to the public for hire. [I.d., § 11.] Source- Compiled Statutes of NEBRASKA Anotated 1907 and 1909. 1905 is the first time motor vehicle appears in NE law. Both years, as above, read exactly like the Legislative Bill of 1905. 5388o Sec. 150 [Municipal ordinances.] Nothing in this act shall be construed in limiting the power of local authorities to make, enforce and maintain any ordinance, rule or regulation, in addition to the provisions of this act affecting motor vehicles. [I.d., § 11.] Source- Compiled Statutes of NEBRASKA Anotated 1911. Note this revision they left of the “which are offered to the public for hire”, now why did they accidentally do that? Notice no ‘for hire’ is stated. *libelant – Formerly the party who filed an initiatory action (a formal declaration of a claim), corresponding to the plaintiff in actions at law. *libelee – one against whom a libel has been filed in a court, corresponding to the defendant in actions at law. *averment, noun – 1. an affirmation or allegation, 2. a formal statement by a party in a case of a fact, or circumstance, that the party declares as true, or a challenge for contrary evidence. *POSITIVE-AVERMENTs – facts declared as being true. *NEGATIVE-AVERMENTs – beliefs that are declared as being false. *American , state-national – a man, with birth right on Nebraska soil, as a man who has not elected to become a United States citizen, as a man who is not a resident of United States, and as a man who does not resides on United States land, as a man who has never contracted with the United States. *travel – use of the open way (road), as non-commercial, not for profit. *American National, noun – as one man, of many men, of birth right ties, to the land that consists of land between Canada’s South Border, Mexico’s Norther Border, the Atlantic ocean and the Pacific Ocean. 1905 is the first time motor vehicle appears in NE law, as House Roll 146, Mr Hand Legislative Bill of 1905. 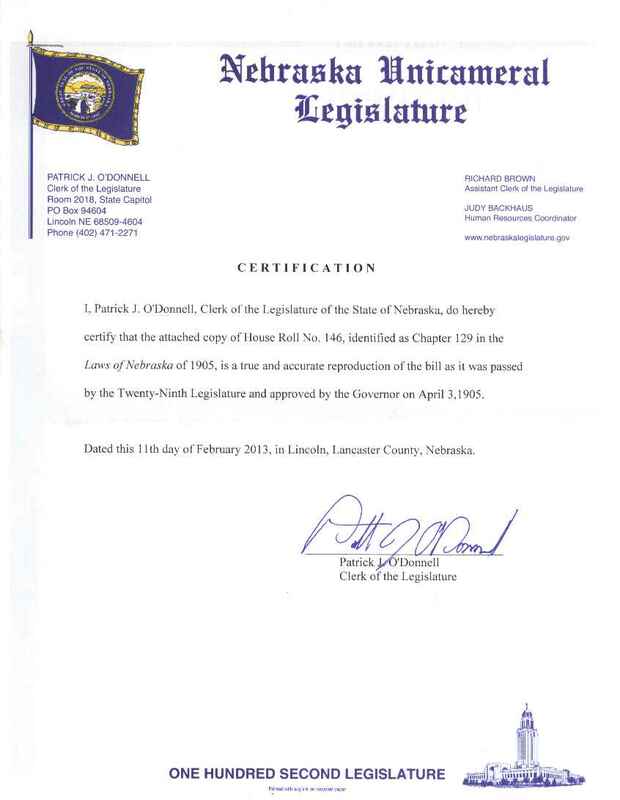 United States Constitution – Article 1, Section 8, Clause 17, The limitations of the United States, which is the same limitations as the STATE OF NEBRASKA legislature. Motor vehicle means any vehicle propelled by any power other than muscular power. Motor vehicle does not include (1) mopeds, (2) farm tractors, (3) self-propelled equipment designed and used exclusively to carry and apply fertilizer, chemicals, or related products to agricultural soil and crops, agricultural floater-spreader implements, and other implements of husbandry designed for and used primarily for tilling the soil and harvesting crops or feeding livestock, (4) power unit hay grinders or a combination which includes a power unit and a hay grinder when operated without cargo, (5) vehicles which run only on rails or tracks, (6) off-road designed vehicles not authorized by law for use on a highway, including, but not limited to, golf car vehicles, go-carts, riding lawnmowers, garden tractors, all-terrain vehicles, utility-type vehicles, snowmobiles registered or exempt from registration under sections 60-3,207 to 60-3,219, and minibikes, (7) road and general-purpose construction and maintenance machinery not designed or used primarily for the transportation of persons or property, including, but not limited to, ditchdigging apparatus, asphalt spreaders, bucket loaders, leveling graders, earthmoving carryalls, power shovels, earthmoving equipment, and crawler tractors, (8) self-propelled chairs used by persons who are disabled, (9) electric personal assistive mobility devices, and (10) bicycles as defined in section 60-611. Nebraska Revised Statute 60-355. Transporter, defined. Transporter means any person lawfully engaged in the business of transporting motor vehicles or trailers not his or her own *solely for delivery thereof (1) by driving singly, (2) by driving in combinations by the towbar, fullmount, or saddlemount method or any combination thereof, or (3) when a truck or truck-tractor tows a trailer. Sole – This may become exceedingly important due to if they have a standing ‘state compelling‘ interest in the property (automobile) they have right to govern it as to ‘registration’, licensed operator, liability insurance, etc. But this share in ownership must be consensual, contractual, and without full disclosure such is a void contract.